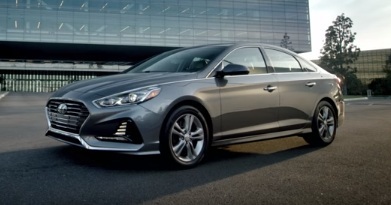 Hyundai introduces the new 2018 Hyundai Sonata in its latest commercial, titled “Happy Drivers”, highlighting that it boasts all the features you need to help keep you happy on the road. “We can’t make your commute shorter, but we can make it better”, says the voiceover at the beginning of the 60-second spot. “We can’t keep Monday morning from coming, but we can make you more comfortable when it does.”, continues the voiceover referring to the heated and ventilated front seats in the new Sonata. “Maybe we can’t stop drivers from sneaking up on you, but we can alert you when they do.”, adds the voiceover, referring to the Standard Blind Spot Detection. “We can’t open up a traffic jam, but we can pump up your favorite jam and keep you connected”, adds the voiceover, while the ad showcases the Infinity Sound System and the wireless device charging system. “We can make the road more exciting. Oh, and we can keep the living good along the way.”, mentions the voiceover as the spot comes to its end, revealing the principle behind the new Sonata: “We believe that a better car makes you a happy driver and happy drivers make better drivers.” and concluding with the brand’s tagline, “Better drives us”.